TORONTO, April 16, 2019 /CNW/ - Last year, Porsche celebrated its 70th anniversary of building sports cars by showing two 911 Speedster Concept vehicles to the public. Now, the production version is celebrating its North American debut in New York. Powered by a naturally aspirated 4.0 liter flat-six engine capable of up to 9,000 rpm that is also used in the current 911 GT3 and 911 GT3 RS models, the 2019 911 Speedster develops 502 horsepower and 346 lb.-ft. of torque, accompanied by a highly emotional, racing inspired soundtrack. Exclusively for the 911 Speedster, this race-bred powerplant has been enhanced with individual throttle bodies that make the throttle response even sharper, just like in the 911 GT3 R race car. To deliver a particularly engaging driving experience highly desired by purists, the 911 Speedster is available exclusively with a GT Sport six-speed manual transmission. 0 to 100 kilometres per hour happens in just 4 seconds, and the top track speed is 310 km/h. 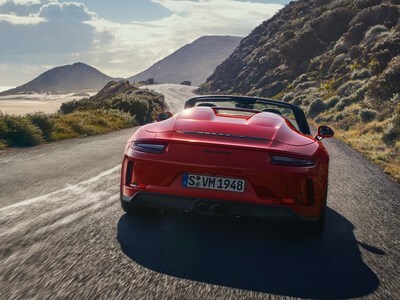 The 2019 911 Speedster is planned to be available for order on May 7, 2019, and is expected to reach Canadian Porsche Centres in late 2019. The 2019 911 Speedster is the first such model developed by the Porsche Motorsport department, but it is still immediately recognizable as a Speedster. The low-cut front windshield and side windows as well as the manually operated lightweight fabric top are characteristic for a Speedster model and make the car stand out. The two streamliners atop the rear deck lid made from carbon fibre composite are another design highlight rooted in the model's history. The interior of the 911 Speedster is characterized by a focus on the essentials of driving. Lightweight door panels with storage nets and door pulls emphasize the focus on weight reduction. The standard black leather interior can be supplemented with red stitching for the dashboard and the "Speedster" designation in the headrests. With this option, red door pulls are fitted as well as a GT Sport steering wheel decorated with a red 12 o'clock centre marker. The interior trim, which spreads to the gearshift knob as well as the doorsill guards with "Speedster" model designation, is carbon fibre. Underscoring its purist focus, extensive measures of lightweight construction help keep the weight of the new 911 Speedster down. The front luggage compartment lid, front fenders and rear deck lid are all made from carbon fibre composite material, while the front and rear fasciae consist of lightweight polyurethane. Standard PCCB (Porsche Ceramic Composite Brake) saves about 50 percent weight compared to cast-iron rotors. The fabric top does without any automated operation, save for the electrically operated latch to lock and unlock it. Air conditioning is omitted in the interest of saving weight, but can be added as a no-cost option if the customer desires. Finally, the six-speed manual transmission saves about 4 kilograms compared to the seven-speed manual transmission in other 911 Carrera models, and almost 18 kilograms compared to a PDK dual clutch unit. With this clear focus on lightweight construction, the 2019 911 Speedster weighs just 1,465 kilograms. 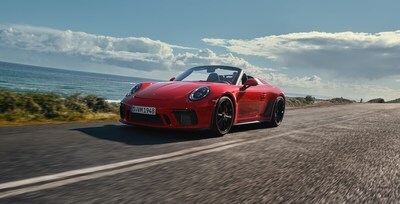 The 2019 911 Speedster uses a chassis derived from the 911 GT3 models with a specifically calibrated rear axle steering system and dynamic engine mounts to deliver a maximum amount of precision, stability and driving pleasure. 20-inch center lock wheels painted in Satin Black are shod with UHP (Ultra High Performance) tires to offer high levels of grip, while standard PCCB (Porsche Ceramic Composite Brake) delivers very powerful and consistent braking performance. The history of Porsche Speedster models began in North America. Speedster variants of sports car models, which combine open-top driving pleasure with incredibly distinctive driving dynamics, have been part of the Porsche company history since 1952. The ancestor of Porsche Speedster models, the 356 1500 America Roadster, had an aluminum body manufactured entirely by hand. It weighed about 60 kilograms less than the 356 Coupe and its top track speed of 175 km/h with its 70-hp four-cylinder flat engine was impressive at the time. Featuring slot-in curtain windows for the doors, a folding top and lightweight bucket seats, this car developed exclusively for the US market was built just 16 times and already embodied several key elements of the Speedster design. By 2010, eight different production and special models bearing the "Speedster" name had been created. The 356 A 1500 GS Carrera GT Speedster represented a highlight in 1957, and the first 911 Speedster followed in 1988. Limited to just 356 units worldwide, the 911 Speedster of the 997 generation built in 2010 was the latest model to be fitted with the famous designation. Exclusively for owners, Porsche Design has created a Chronograph 911 Speedster timepiece. The high-performance Flyback-Chronograph with Werk 01.200 in-house movement features Speedster-specific design elements such as a carbon fibre dial, and rotor modeled after the Speedster center lock wheel, in both design and colour. Genuine Porsche interior leather and thread are also used for the perforated black leather strap with red stitching. About Porsche Cars Canada, Ltd. Established in 2008, Porsche Cars Canada, Ltd. (PCL) is the exclusive importer and distributor of the Porsche 911, 718 Boxster and 718 Cayman; Panamera; as well as Cayenne and Macan. Headquartered in Toronto, Ontario, since 2017, PCL employs a team of more than 50 in sales, aftersales, finance, marketing, network development, and public relations. They, in turn, work to provide Porsche customers with a best-in-class experience in keeping with the brand's 70-year history of leadership in the advancement of vehicle performance, safety, and efficiency. In 2019, a Parts Distribution Centre will open its doors and service the countrywide network of 19 Porsche Centres. PCL is the dedicated subsidiary of Porsche AG, headquartered in Stuttgart, Germany. In 2018, Porsche sold an unprecedented 8,904 units in Canada, up 7.9% over the prior year.